Understand the definition of SWOT. Learning how to write a SWOT analysis is one-step every business owner should take. The SWOT analyzes the strengths, weaknesses, opportunities and threats any business faces. 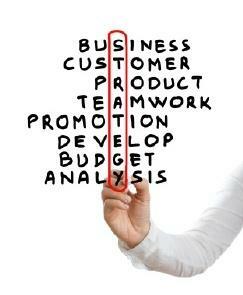 It can help you to build your business plan or help you to make marketing decisions. The SWOT analysis also allows the business, management and employees to make changes to keep the business moving profitably towards industry changes. In order to learn how to write this type of analysis, you need to break down each part of the SWOT and list factors related to each portion. Strengths and weaknesses are those internal factors that influence the business's success. Opportunities and threats are external factors that affect the business directly. In the following breakdown, examples to consider are listed. However, these examples may fit into other areas of your SWOT. If your business has a strong management team, this is a clear strength. However, if your business struggles with management, this could fall under your weaknesses. Consider all examples for each topic as it relates to your business. List any and all strengths the business has that work to make the business the better choice against competition. Strengths should focus solely on internal qualities. Next, take a hard look at the company's weaknesses. Most businesses will have areas where improvement is necessary and that improvement could push the business to more profit or more long-term success. List any internal weaknesses, which demand attention or could be improved upon. List any type of weakness that could be improved upon even slightly. In this type of analysis, gathering facts like this can help you to see what the total picture is. Be sure to focus on all areas of the business. Next, turn your focus outward and look towards external factors that affect the business. Specifically, look at the opportunities the business has against the competition. Any type of opportunity out there could help the business to increase profits or to improve customer relations. Since the company's goal is to move towards the industry and towards customers, opportunities allow the business to see where it could move ahead. List all opportunities in the analysis. Often, to get this information, the industry, as a whole needs to be considered, but ultimately, it becomes important for there to be a focus on small sectors where change could be evident. By spotting these opportunities, the business can seize them and beat the competition at it. Threats are any type of move by the competition that could harm the business's ability to profit or to grow and expand. Threats are external in that you are not looking for problems within your organization but those affecting it indirectly from the competition. If a threat is evident and the company is unable to adapt to the threat, the company loses profit or market share. Learning how to write a SWOT analysis does not stop here. The final element of this document is an area that refocuses the business' goals around the details found. It should point out the key factors the company is going to focus on as it moves forward in its plans to expand and profit.